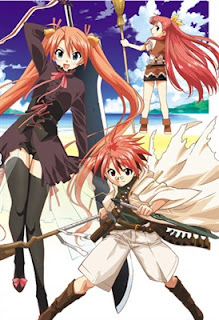 Anime-zing Funtime Blog: This Needs A Reboot: Negima! See? Just like Harry Potter, right? Right? Fine! I see how you are! Out of all the series I have, I think the one that deserves a major reboot is Negima, or as I like to call it, Japanese Harry Potter. Why does it deserve such an undertaking? I think the answer is simple to fans of the series, but I will highlight those to someone who perhaps doesn't know the background of the series. Xebec produced the first series called Negima. It wasn't horrible by any means, but it wasn't great either. The animation left something to be desired and the characters sometimes looked or acted different. Also, there is that whole issue with the last six episodes thing. You know, the original anime story where a certain main character dies and everyone and their mother becomes emo and kiss each other. That one. Anyways, aside from those, the series wasn't great, but it did fine when it did follow the manga. So thankfully they announced a second series that has the potential to surpass the current one in style and execution. Or not. Negima!? is for all intents and purposes, a re-imagining of the series, opting for more comedy and less epicness. The good news is that the animation is a LOT better, I mean c'mon, it is Shaft, but the story is not as good in this fan's opinion. I wanted the original manga, not some odd sidestory that involves the same characters and has everyone's maturity and intelligence level divided by a factor of ten. It eventually became known in the manga world as Negima Neo, which...again, isn't as good. Then there were the Spring and Summer OVAs. Let's forget those even exist. Finally, there are two OADs which were sold alongside the sale of the bound copies of the Negima manga. Out of all the series, these are the ones to watch, as long as you have read the manga up to the point these begin. It is once again animated by Shaft, but much more closely follows the original manga quite nicely. I watched all of the first OAD, and felt satisfied. THIS is the Negima anime I had been waiting for. Sadly, there are only eight episodes total between these two series, and they have yet to be licensed in America. There are a few other series, like the introductory OVA, live action series, and so forth, but I wanted to focus on the main ones released in the States. There is also a mini-movie planned (double billed with Hayate, another favorite manga of mine), but it is just to finish the job the OADs started. Would I be creepy if I said that Asuna looks hot like that? 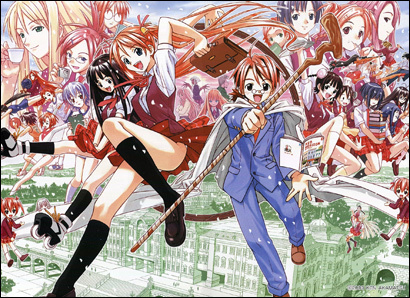 In my opinion, Negima deserves a fresh start. First, find a studio like Shaft that actually cares about the source material. Second, give the anime more than 24 episodes to tell the story, make it like Fullmetal Alchemist or Soul Eater. It is a fairly big franchise on both sides of the pond, so just give it the series it deserves. Finally, and I cannot stress this enough, do NOT let the studios make their own stories. Anytime the series strays away from the source material the series suffers. Just stick with the manga and everything will be peachy keen. You let Fullmetal Alchemist get away with this, so I feel that Negima should be given similar treatment. I know the likelihood of this happening is slim, but it needs more of a fair chance than it got. Make it like the OADs and it will be great, I guarantee it.